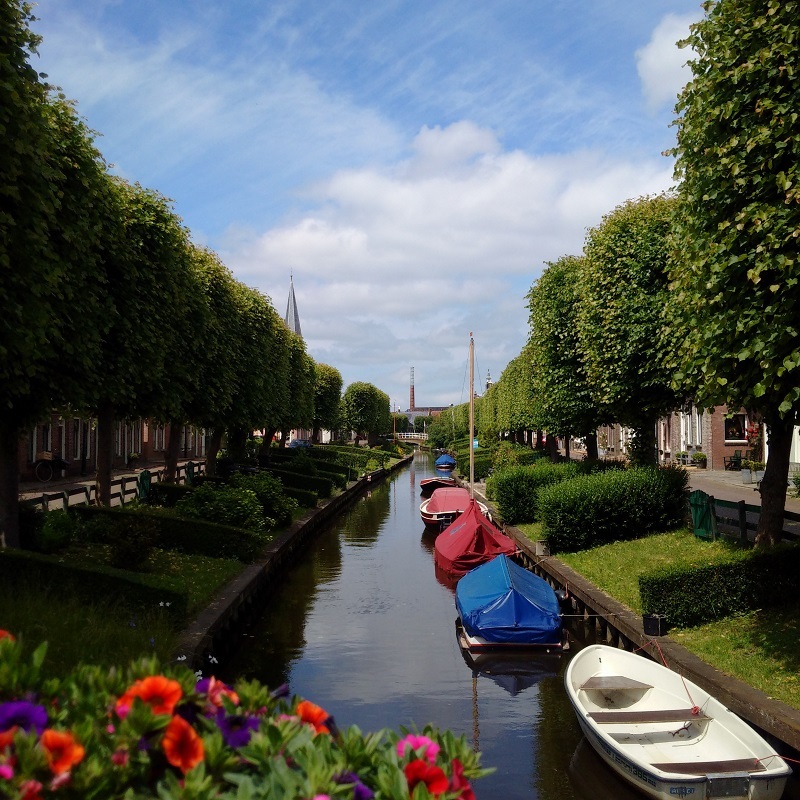 We continued our plan of cruising inland through Friesland today, leaving Bolsward and fully intending to go to Sneek but we were taken with the little historic town of IJlst and found a friendly local to come aboard and so stopped there for the rest of the day and night. 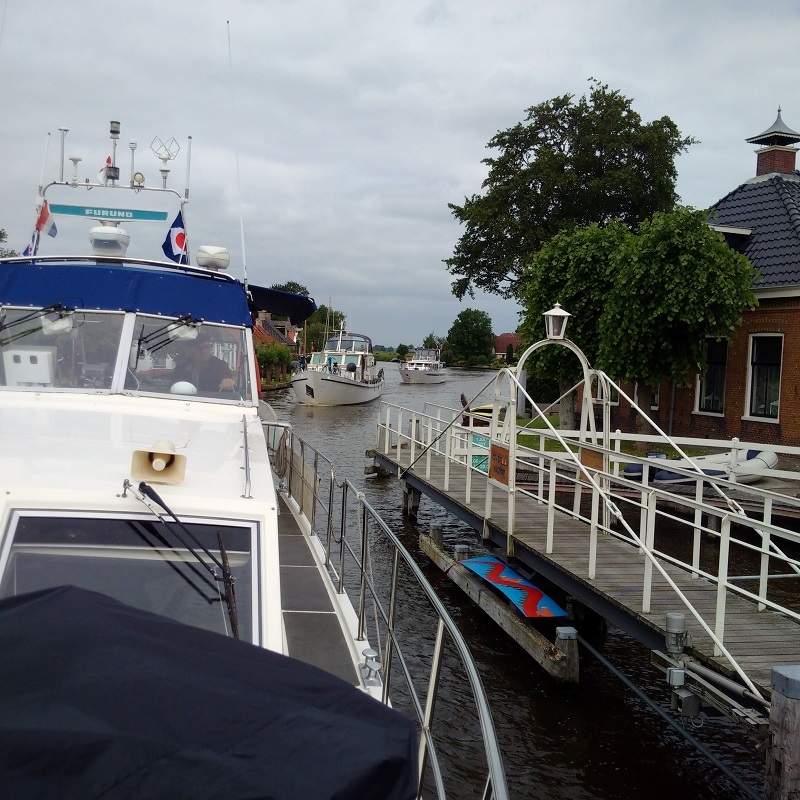 The cruise began in a bit of an unsettled way as we had prepared Lady Martina and had just made some toast and honey with a mug of tea, when I saw two boats leaving and thought that perhaps I should get going to catch the same bridge. 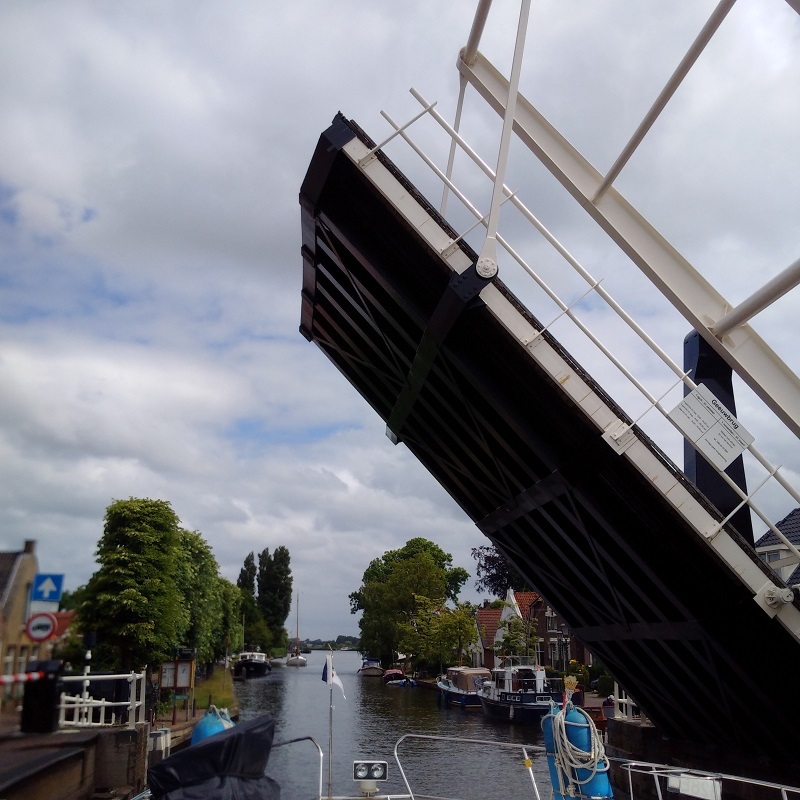 This thought was wrong as the first vessel went straight under Kruiswaterbrug without need to lift and the second hung around just off the water berth; reminding me that we should top up our water too! I stayed there for a while, eventually noticing that the boat moored at the water staithe had only just started to fill and we had to wait for that to complete, and the next one to fill, before we could go alongside ourselves. There seemed to be little wrong with the water flow (once Kathleen had turned it on fully!) and so we did not know what delayed the other boats and so we were soon underway, the bridge lifting to order and letting us cruise into the main navigation and turn left, or south-east, heading towards IJlst. We found ourselves in a convoy and so I adjusted our speed to keep it together as I lead them through three lifting bridges to approach IJlst. There was then the railway bridge at which we pressed the button and then called the bridge-keeper on the quoted mobile and learnt that they would swing in 6mins. They were true to their word and we went through this bridge, turned left into a wider section and then got the Ophaalbrug into IJlst to swing and then proceeded through. I spotted a central mooring free and so stopped immediately, causing some congestion, until we were safely moored and could relax. An old lady was at the moorings and I chatted to her when mooring and then she tried to get us a sticker for IJlst and arranged for her brother, the duty harbourmaster, to come by with one later, as he collected our berthing fee. We had invited her on board when we moored and given her tea and biscuits as we chatted together.